An artist's rendering of the plan for Mae S. Bruce Park in Santa Fe, Texas, was posted to the campaign's GoFundMe page. SANTA FE, Texas - A campaign has been launched to help fund a park in Santa Fe aimed at healing the community after last year’s school shooting. Keep Santa Fe Beautiful created a GoFundMe page Feb. 3 to raise money for the project that will redevelop Mae S. Bruce Park. “In June, a Santa Fe alumni, resident, and mother of two Santa Fe High School teenagers, approached the City of Santa Fe with an idea to redevelop an underutilized city park into a serene and restorative therapeutic garden to help the community of Santa Fe begins to heal,” the page reads. 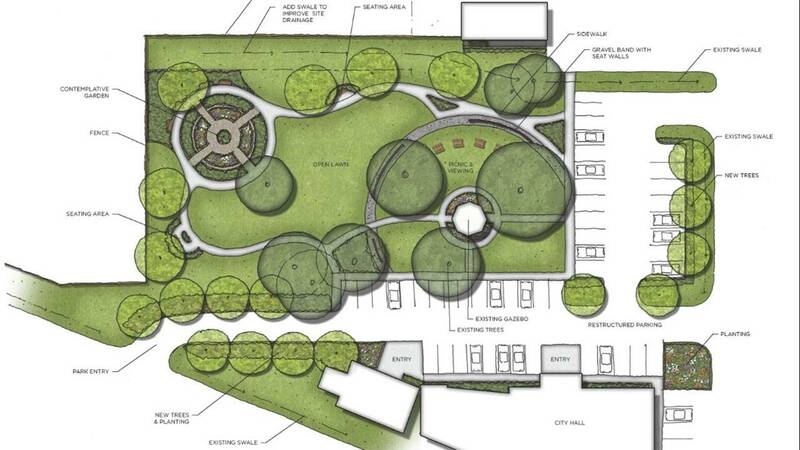 The plan calls for the creation of a sensory garden, walking trail, meditative areas, a water feature, artful mosaics, community seating and an open lawn next to a gazebo. To donate to the $350,000 goal, go to GoFundMe.com. Ten people were killed during the shooting at Santa Fe High School on May 18, 2018. The suspect is awaiting trial.